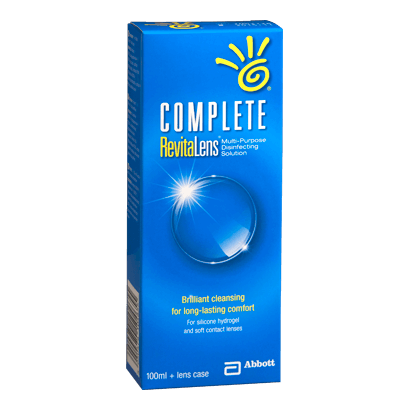 Complete RevitaLens multipurpose solution is an effective disinfectant and cleanser for use with all soft contact lenses, including silicone hydrogel lenses. RevitaLens will clean, rinse and disinfect, while removing surface deposits and re-wetting your lenses for comfortable wearing. If you’re looking for a hygienic way to store your contact lenses and care for them overnight, Complete RevitaLens multipurpose solution is a great choice. This 100ml bottle of solution comes with a handy lens case for safe storage of your contacts.